Discussions went round and round... finally tried viewing the contents of file: "cat (hdX,Y)/boot/grub/grubenv" via the Grub shell and the correct "Windows ..." string was in the file. So the problem I think must be in Grub reading that file and/or selecting the correct partition from the boot menu list. Since conversation has ceased in the forum, opening a bug report against what we have encountered. We have loaded several systems with Ubuntu 9.10 dual-boot, want to configure all of them to utilize "saved" last boot choice. Then only way I have found to get a different default than Ubuntu is to force the default to be Windows and that does work. 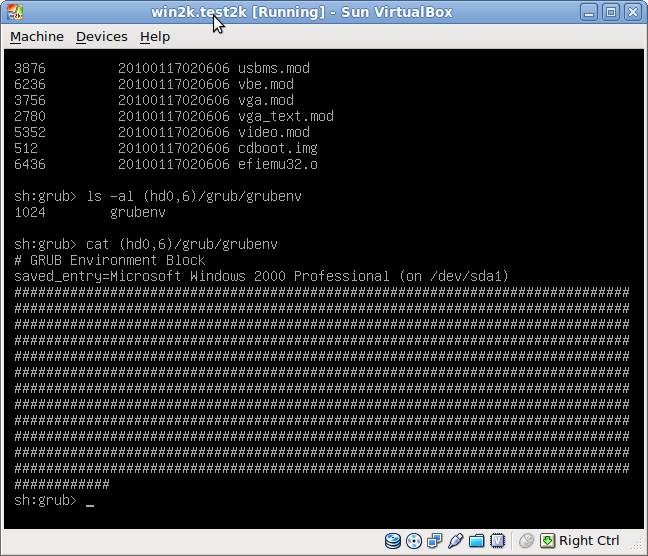 A view of the grubenv file showing Windows is the OS remembered, yet the top choice of Linux is selected. I just now tested this issue against Lucid Alpha 2 and that release works properly. 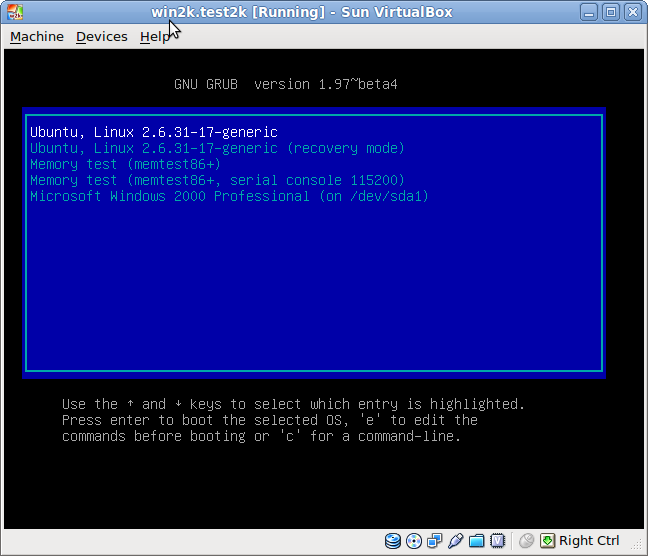 Booting to Windows, rebooting, Windows is then the default grub entry. Thus I think this only is a bug in Ubuntu 9.10. I have a similar bug in 10.04 alpha. My system never saves the booted OS entry and therefore always boots the top menu item. If I change the GRUB_DEFAULT= to a number it will boot that entry correctly. I just re-tested this issue with the 20100426.1 daily image. Broken even a bit worse than last reported against 9.10. Now I have added GRUB_SAVEDEFAULT=1 and put back GRUB_DEFAULT=saved. Booted to Windows XP, upon reboot it is set to the top Grub menu choice which is Ubuntu. Really odd that it would take Grub2 TWO entries in order to get it to save the last booted OS choice... and that GRUB_SAVEDEFAULT= does not appear at all in the default configuration file, just commented out. I would have expected it to be there commented out. Having to add the GRUB_SAVEDEFAULT= entry to the default config file is just insane. I have never been able to get the Grub2 saved selection to work because I never had this obvious entry in my config file, silly me for expecting the provided entries - commented out or not - to actually be comprehensive enough to be useful for this BASIC functionality. Stuff like this is one of the reasons people keep using legacy software and get frustrated when the new "improved" version of something make their life more difficult or just doesn't work. @Huseyin AKIN #10: Thanks, those concise steps actually worked. Thus, solution confirmed. Tested on fully updated 10.04. A commented "#GRUB_SAVEDEFAULT=true" needs to be in the default config file as this saving of last booted OS will not work otherwise. Insane to expect people to happen to know what to hand key in to make Grub2 work the way Grub used to be able to work WITHOUT needing to know what line to add.